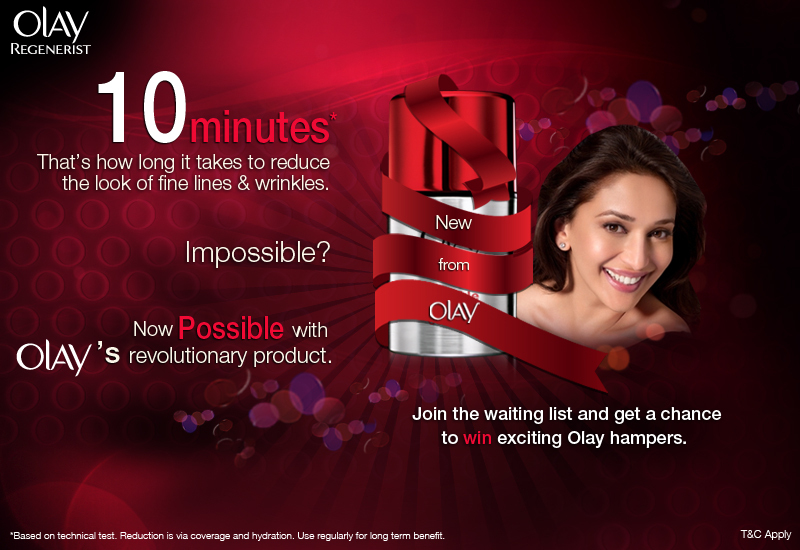 Olay is running a pre-launch campaign on Facebook for its new Regenerist range, endorsed by Madhuri Dixit. According to claims, the anti-aging beauty product now just takes 10 minutes to reduce fine lines and wrinkles. 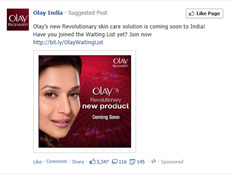 To create buzz, ‘Suggested Posts’ are being used to drive users to ‘Like’ the Olay Brand page on Facebook and also ‘Join the Waiting List’ for the brand. This is interesting and the first brand that I’ve seen using this ad format, and it sure did work as it caught my attention. Suggested Posts are the new Facebook advertising option, on the lines of Promoted Tweets on Twitter, that brings up branded posts on user’s news feed. The posts include image and copy just like posts from your friend network, with an additional option to ‘Like’ the page. This one popped up right after the most popular post on my news feed so there was no way I could have missed it as a user. Though intrusive, this is a good opportunity for brands to reach users, increase awareness, be right in front of them with their advertising message and increase Fan base. Coming back to the Olay campaign, random winners selected from the promo will stand a chance to win Olay hampers. A counter gives out the number of people on the ‘waiting list’ and you need to share your contact details to be eligible to win the hamper. I don’t get the promo concept. As a consumer what do I get by being on the ‘Waiting List’? I will still need to buy the product with my money and being on a ‘waiting list’ is not a great feeling, I’d rather buy something else. I guess they meant 'waiting for the product to launch list' and got the expression all wrong. Waiting List has a negative connotation, according to me. Maybe there is something more to the campaign, we will know at launch. Suggest a Campaign. Share your Feedback. Making good decisions is a crucial skill at every level. All opinions expressed on this blog are personal. All images are screenshots of live sites and are not created or owned by the author, unless otherwise stated. Copyright © Powering Brands. All Rights Reserved.. Powered by Blogger.